DAY 2 GIVEAWAY: TUBBY TODD BATH CO.
Those who have followed me for the past 1.5 years, or who are friends or family, have heard me profess my love for Tubby Todd Bath products time and time again. Here's the deal, guys: They are 100% natural; made with wonderful ingredients. The scent you smell when you open a bottle of the lavender and rosemary wash or the lotion is divine. Same goes for the sweet quince and honeysuckle bubble bath or baby spray. The minty dream cream is also delicious. It is everything I want my babies to smell like always. We became consumers of Tubby Todd back in the fall of 2014 when there was just body wash, and lotion. Now we have tried and loved all the products they offer. My kids have not struggled with eczema or other skin irritations so I can't review much about Tubby Todd in that department, but others have and you can read about it on their website and through posted testimonials on their Instagram. (Both linked below.) 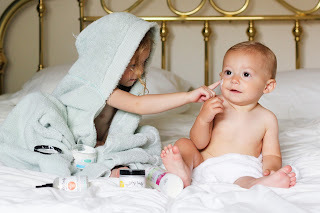 I'm just a mama who enjoys delicious smelling, pure, natural goodness to lather up and smooth on my babies skin. Their bubble bath creates the fluffiest of bubbles, and the bath wash is super sudsy and safe on their little eyes. The lotion, dream cream, and all over ointment goes on so smooth and is never greasy. I have been using the all over ointment on Dash's healing scars, as well as his knees and elbows that get rough from army crawling like a maniac. I am constantly spritzing the baby spray on their linens which happen to mostly be our linens since they sleep with us. That spray is completely genius. I have never regretted a purchase from them, and have used each product for numerous things. Can we talk about the products for moms that they have coming down the pipeline!? I'm a little excited! They would not be a part of our week of birthday giveaways if they weren't a part of our favorite things list. I am so excited for you guys to get your hands, or I guess your babies hands, on some Tubby Todd goodness! *Make sure to follow both me and Tubby Todd on Instagram!